New York: Wall Street stocks fell on Tuesday after a Moody’s warning about France’s credit rating added to worries about Europe and mixed earnings from some big corporations. International Business Machines Corp fell about 4% to $178.75 after Big Blue’s quarterly earnings beat failed to stem worries about a slowdown in technology spending. Moody’s cautioned it may slap a negative outlook on France’s Aaa credit rating in the next three months if costs from helping to bail out banks and other euro zone members stretch its budget too thin. China’s economic growth slowed in the third quarter to its weakest pace since early 2009. Gross domestic product rose 9.1% in the quarter from a year earlier, but was down from 9.5% in the previous period. “There is lot of confusion about how to interpret what’s going on," said Nick Kalivas, an analyst at MF Global in Chicago. “People are trying to figure out what to do with earnings and China." 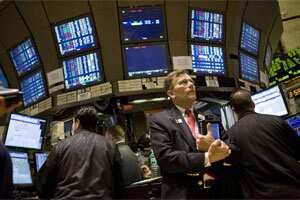 The Dow Jones industrial average dropped 82.87 points, or 0.73%, to 11,314.13. The Standard & Poor’s 500 Index dropped 6.65 points, or 0.55%, to 1,194.21. The Nasdaq Composite Index dropped 22.07 points, or 0.84%, to 2,592.85. Goldman Sachs Group Inc, the largest US investment bank, lost $428 million in the quarter, only its second quarterly loss as a public company, on a sharp decline in the value of investment securities and customer trading assets. The shares rose 0.5% to $97.47. Bank of America Corp, the biggest US bank by assets, reported a $5.9 billion profit after accounting gains and asset sales, though the bank’s main businesses showed signs of weakness. The shares rose 3% to $6.20.